Have you seen the horses under the sea? Sometimes, we don’t realise the curiosities that could be found right at our doorstep, all you must do is look. If you ever find yourself around the Thesen Island Marina in Knysna, be sure to look out for a little boat chugging along with a couple of students and a pool net on board. They’re not there to scoop leaves out of the Marina, I’m afraid, but rather to look for an illusive little fish known as the Knysna seahorse (Hippocampus capensis). Figure 1: David Taylor and Mark Hodgson on the RV Outeniqua, ready to commence with fieldwork! These little fish are very special, not just because they are only found in three estuaries, the Knysna, Keurbooms, and Swartvlei, but also because seahorses are interesting in themselves. Like penguins, seahorses will mate for life, and the males are the ones who carry the young to term and give birth to the offspring. Now, these little guys are not all cute, especially if you’re a crab. The Knysna seahorse can camouflage into their background quite easily and so they often lie in wait, like a cat ready to pounce, for an unsuspecting crab to swim by… and because these seahorses don’t have stomachs, they have to eat constantly. 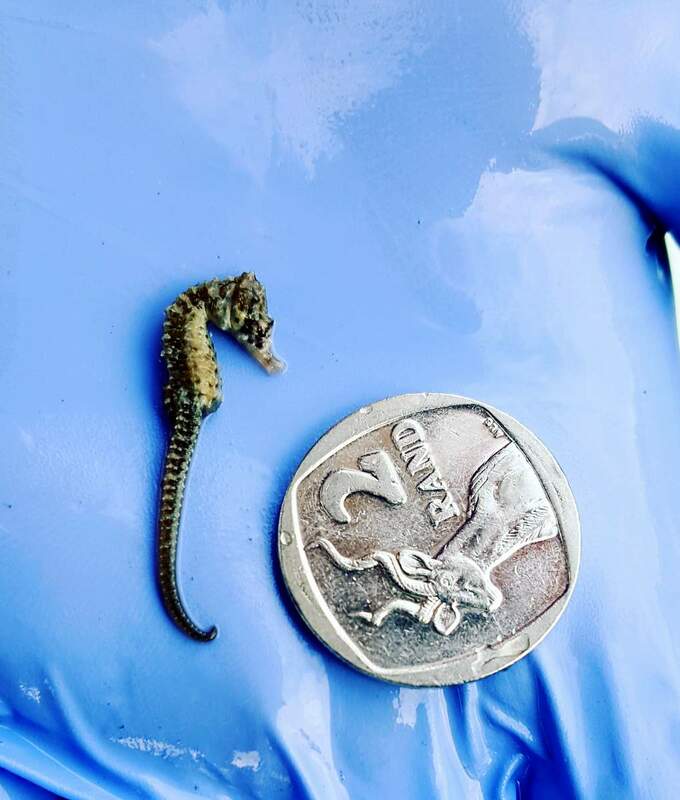 Figure 2: A juvenile Knysna seahorse found during our fieldwork. Considering these unique creatures, it is vital to protect them and to ensure that the population is healthy. The Knysna seahorse was the first seahorse species to be classified as ‘endangered’ by the International Union for the Conservation of Nature (IUCN). This is because seahorses are highly affected by human activity in their habitat. The decline of the Knysna seahorse population is often due to construction on estuary banks, deteriorating water quality and habitat loss. Figure 3: Some of the other interesting critters that can be found in Thesen Islands Marina. Montitoring of seahorses within Thesen Islands Marina commenced in 2015 as part of the Knysna Seahorse Status project. Cassandra Barker from Rhodes University in association with Louw Claassens of the Knysna Basin Project will continue with this programme for 2018. Cassandra is completing her Honours degree in Marine Biology and chose this project as one of her focuses for her degree. She uses the pool net to scoop up Codium tenue, a spongy green alga, to sort through to find the seahorses. She, with the help of volunteers, has found quite a few seahorses and other curious creatures, like cushion starfish, pipefish, nudibranchs and shaggy seahares, living in the Marina.